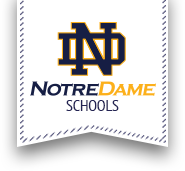 The Notre Dame Girls varsity basketball team would like to invite you to their 2017 Summer Skills and Drills Basketball Camp! We are excited to offer you a positive, competitive and interactive environment that will challenge and enhance both your physical and mental game. Whether you are a varsity player, a beginner or somewhere in between, all are welcome and will be sure to leave with more knowledge, skill, and confidence than when they started. We can’t wait to work with you! When: July 18th, 19th, 20th 9:00 a.m. – 12 p.m. Registration begins July 18th at 8:30 a.m.